Rated ☆☆☆☆☆ (4.8 out of 5) based on 18 reviews. Rated ☆☆☆☆ by Eve Calitz, South Africa on 10-Jul-2014 . What a pleasure to stay at this lovely B and B. 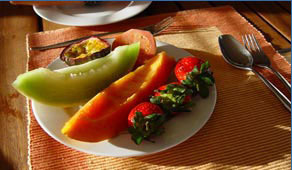 Warm welcome, comfy clean rooms, delicious breakfast, crisp clean linen and the friendliest hosts one could wish for. Look no further if you want to be assured of a really lovely central spot to stay over in Umhlanga. Superb! Rated ☆☆☆☆☆ by Colin Thompson, South Africa on 5-Mar-2014 . Rated ☆☆☆☆☆ by Helene Train, South Africa on 25-May-2013 . Rated ☆☆☆☆☆ by Matthew Simpson, South Africa on 14-Feb-2013 . Rated ☆☆☆☆☆ by Dave Smithson, Australia on 6-Feb-2013 . Rated ☆☆☆☆☆ by Martin, Zanele, Jerry and Julia, South Africa on 5-Jan-2013 . Staying at Umbrella Tree was an awesome experience. Staying at Umbrella Tree was an awesome experience and our host, Lesley is such an amazing person. Thank you again and please keep up the good work you are doing. We are so grateful to spend our holidays in Durban, more specifically at Umbrella Tree. LES U R A STAR!! Rated ☆☆☆☆☆ by Rene and Adriaan, South Africa on 5-Jan-2013 . We were so lucky to have found this gem of a guesthouse! We were so lucky to have found this gem of a guesthouse! Thank you Lesley for an amazing stay. Everything was just perfect with a great breakfast every morning. This is the most comfortable bed we have come across in a long time! Makes one feel well rested everyday. Keep up the great service and work you do. We're looking forward to return sometime (hopefully) soon! Rated ☆☆☆☆☆ by Liesbet Nel, South Africa on 22-Jun-2012 . What a wonderful weekend! I will recommend this guesthouse to anyone looking for that personal touch! 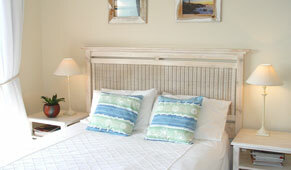 Our spacious room had a sea view, beautifully decorated and Lesley was so caring, friendly and helpful. The breakfast was delicious and fresh! Thank you so much for a great weekend! Rated ☆☆☆☆☆ by Dorothea Springbok, South Africa on 1-Jun-2012 . Rated ☆☆☆☆ by Debbie Geyer, Switzerland on 25-Mar-2012 . Lesley is a fantastic host; we were very well looked after & slept wonderfully in her clean, comfy & homely bed & breakfast! Rated ☆☆☆☆☆ by Edward & Wilma Duller, United Kingdom on 22-Feb-2012 . Umbrella Tree is the Tops! Rated ☆☆☆☆☆ by Elizabeth Ruddick, Canada on 21-Nov-2011 . I was passing through Durban twice in the past month and stayed at the Umbrella Tree House B and B both times. Not only is it very convenient to the airport, but the accommodation is very comfortable and Lesley is a wonderful host. She provided great advice on near by restaurants, arranged for taxis both to/from the airport and locally and made a very nice cooked breakfast. It was a very comfortable stay and I would recommend Umbrella Tree House B and B without hesitation. Rated ☆☆☆☆☆ by Uwe Koller, Germany on 6-Jul-2011 . Rated ☆☆☆☆☆ by Antoinette Botha, South Africa on 27-Nov-2010 . Stunning accomodation!!! Great sea view, friendly welcoming hostess and best b&b breakfast! Thanks to Lesley and her team!! Rated ☆☆☆☆☆ by Yolandie and Reynard Hutten, South Africa on 1-Jan-1900 . It was home away from home for us it was wonderful. The host was so friendly and she maid the most delicious breakfast every morning. And a compliment too that the fotos on the website is 100% the same as the rooms you are staying in. We just want to thank umbrella tree cottage for everything will definitely come stay again. Rated ☆☆☆☆☆ by Kayleigh Peter, South Africa on 1-Jan-1900 . My husband and I just recently stayed at the Umbrella Tree Guest house and were honestly blown away. A cozy place to stay with so many facilities, friendly hosts and great food at a great price, will definitely go back! Rated ☆☆☆ by Lionel ND CATHY BYARD-WILKS, South Africa on 1-Jan-1900 . Rated ☆☆☆☆☆ by Charlissa Simpson, South Africa on 1-Jan-1900 .